This week, Mousetalgia welcomes Jeffrey Epstein to the show to talk about D23 past, present and future! 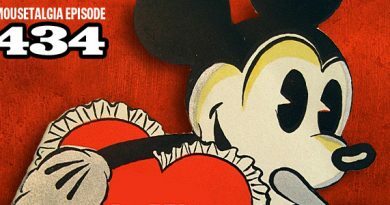 We look back at the launch of D23 – Disney’s official fan club – over 7 years ago, and then discuss other current D23 happenings, including the “Fanniversary” events celebrating Beauty and the Beast and other upcoming opportunities for club members. We also host a Mousetalgia therapy session for a listener who, having fallen in love with Disneyland, has a hard time resisting comparing it with Walt Disney World and feeling like WDW falls short. Is it okay to compare the two resorts, or should Disney fans hold a special place for all the parks in their hearts? Also, listener reports on Shanghai Disneyland and Steakhouse 55, and two runDisney reports – one on last week’s Disneyland Half Marathon weekend, and one on runDisney’s recent virtual races. Plus – Tim Burton, Disney-themed t-shirts… and more.